Washington (CNN) - Mitt Romney's favorable ratings are on the rise, but a new national poll indicates that President Barack Obama remains more popular than his Republican challenger. According to a CNN/ORC International survey released Monday, Romney's favorable rating among Americans has jumped from 34% in February, during the heat of the divisive GOP presidential primaries, to 48% now. Forty-two percent say they see the presumptive Republican presidential nominee and former Massachusetts governor in a negative light. While rising 14 points since February, Romney still trails the president, who currently has a 56% favorable rating, with 42% saying they hold an unfavorable opinion of Obama. The president's favorable and unfavorable ratings are unchanged from CNN polls in March and April. 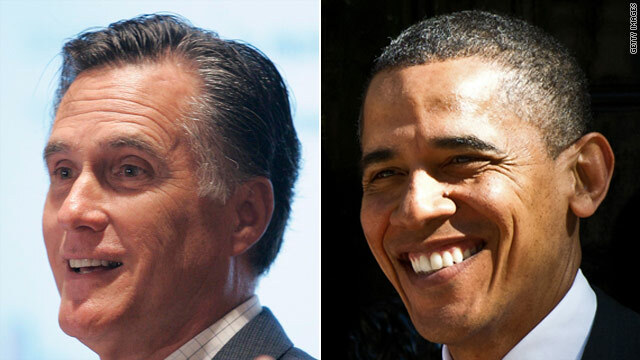 “The biggest gap between Obama and Romney's favorable ratings is among younger Americans. More than two-thirds of those under 30 have a favorable view of Obama, compared to only four-in-ten who feel that way about Romney. Romney is much stronger among senior citizens, but the gap is not nearly as big," says CNN Polling Director Keating Holland. "Romney may have a small advantage among independent voters, but that is offset by his lower favorable rating among Republicans than Obama has among Democrats." According to the survey, six-in-ten Americans say that Obama has the personality and leadership qualities a president should have. "That's nine points higher than the 51% who feel the same way about Romney, who's rating on that question is actually down since last fall. Neither candidate has an advantage on the issues - roughly half the public says they disagree with each candidate on important issues," adds Holland. The views of the president and Romney are contributing factors to Obama's 49%-46% margin over Romney in the overall race for the White House. The president's margin is within the survey's sampling error, meaning the battle for the presidency is basically tied with just over five months to go until the November election. The poll indicates that Vice President Joe Biden doesn't fare as well as his boss, possibly because he has assumed the traditional attack-dog role of a vice president running for re-election. Only 41% of Americans have a favorable view of Biden, with 44% having a negative opinion of the vice president. This is the first time since the 2008 general election that Biden's favorable rating has been lower than his unfavorable number. According to the poll, 65% say they have a favorable rating of first lady Michelle Obama, with 27% saying they see her in a negative light. Four-in-ten say they have a favorable opinion of Ann Romney, with 22% saying they see Mitt Romney's wife in a unfavorable way, and nearly four-in-ten unsure. The survey also indicates that two-thirds of the public has a favorable opinion of Secretary of State Hillary Clinton. The CNN poll was conducted by ORC International between May 29 and May 31, with 1,009 adults nationwide, including 895 registered voters, questioned by telephone. The survey's overall sampling error is plus or minus three percentage points, with a sampling error of plus or minus 3.5 percentage points for registered voters. If you repubs would quit watching Faux News you wouldn't have a reason to dislike Obama. Republicans don't make the grade. Why not have a poll of who farts the loudest. Polls are getting tiring, everyday, day after day, what a waste. The dust has settled and they are stuck with the bishop. What else are they going to do? Even those who "endorse" this clown do it with clenched teeth. That includes the newterman who has probably been promised adelson forgetting he wasted all that money on his campaign. The bishop is all about money and how to hide being a bully and an animal abuser and we all want a mansion on a golf course with a pool! I am voting for Obama. Yes, on obama12. It may be because the primaries are over and there are less anti Romney ads being aired. I think that they are doomed to fall because he will be putting his foot in his mouth more often than Obama. Besides, his plans have the assumption (which isn't correct) that the wealthy having money and making money will trickle down to everyone else. That only works an ideal world where the wealthy spend just about everything. That isn't here. no, they are all so plastic. During the primary campaign, we learned through polls that the more people got to know Romney, the less they liked him. Reason: he's blows with the wind, jettisons his stated "convictions" when others are more favorable to adopt, he's spineless (won't stand up to birthers or the nuts who insist Obama is an alien) and he lies on things big and small: "I left the governor's job to return to the private sector"; "the inspector general found that Obama had directed Solyndra money to friends and family" - only two of the demonstrable lies he's told. The man has no character and someone with no character (Nixon, W) does not make for a positive presidency. Check out the skewed sampling on this one. Obama leads Romney by 3pt's overall in a poll ( with a professed 3pt. margin of error!) of about 900 registered ( not "likely") voters nand then to give Obama that little added push, CNN throws in another 115 "unregistered " voters. Remove those 115 unregistered voters and you got a tie even in this day and age when almost anyone signing up for food stamps is automatically registered .